When you fly over to New York City for the first time, it’s hard to make out what anything is. But taking in the view of the large city (which I always thought consisted of Manhattan, only) was something I never thought I would experience. Although it was my first time visiting the Big Apple, I did a lot of research to ensure I would not be eaten alive. I searched through maps, pictures, blogs, and info graphs, but nothing compared to being in the middle of the city and looking straight up at the tall buildings. I was terrified. Lucky for you, I have created an easy outline of what you must do to survive your first visit to New York. Booking your flight is going to be a journey in and of itself, finding an airline that suits your needs and budget might be a challenge. I booked with JetBlue who has a surprising amount of legroom along with a TV to watch throughout your five-hour flight. Before you board, don’t forget to bring a pillow and a blanket. After you go through TSA you can buy snacks and bring them on the plane so you don’t go hungry and settle for a sandwich in the air. Kimberly’s view while taking a daring photo during a helicopter ride. Unless you have family out in New York, the easiest way to find a hotel is to make sure you are in Midtown. This way you will be within a reasonable distance from all the fun attractions you want to see. 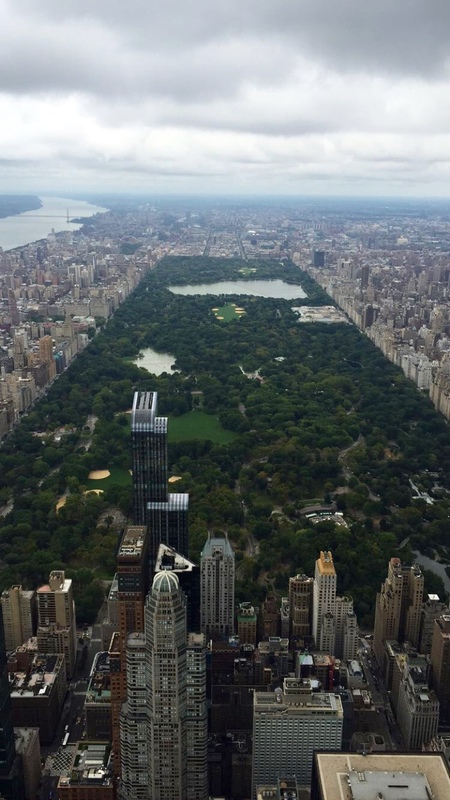 I stayed at the Holiday Inn on West 57th street and was only a few blocks from Central Park and Time Square. If you land in JFK, it will be about a 45-minute ride to Manhattan. Try to brace yourself for the ride since the cabs out there are only worried about reaching their final destination. Stepping out of the cab and taking in how large the city actually is may be intimidating, but I assure you the locals have tricks up their sleeves on how to get around. The first thing you want to do is download a subway app. Two apps I found helpful were “New York Subway MTA” and “Transit Tracker.” These will be your life savers, but make sure you become accustomed to your sense of direction and know which way is North and South. After you have settled in and have a sense of how to get around, there are some landmark places you must see while you are there. The Statue of Liberty, The Rockefeller, The Empire State Building, Central Park, Time Square, Grand Central Station, Ground Zero, Wall Street, and the Brooklyn Bridge are only a few must see places in Manhattan. Day view of the famous Brooklyn Bridge connecting Manhattan and Brooklyn since 1883. An easy way to gain access to these places is purchasing The New York Pass, which lets you into all the museums and attractions you can think of. If you want the full tourist experience, the double-decker buses are a good addition to your trip as you can hop on and off of them throughout the city. Although these places are all located in Manhattan, you are going to want to take time to visit some other boroughs (Brooklyn in particular.) Here you’ll find the best pizza and the most of the “hipster” scene. 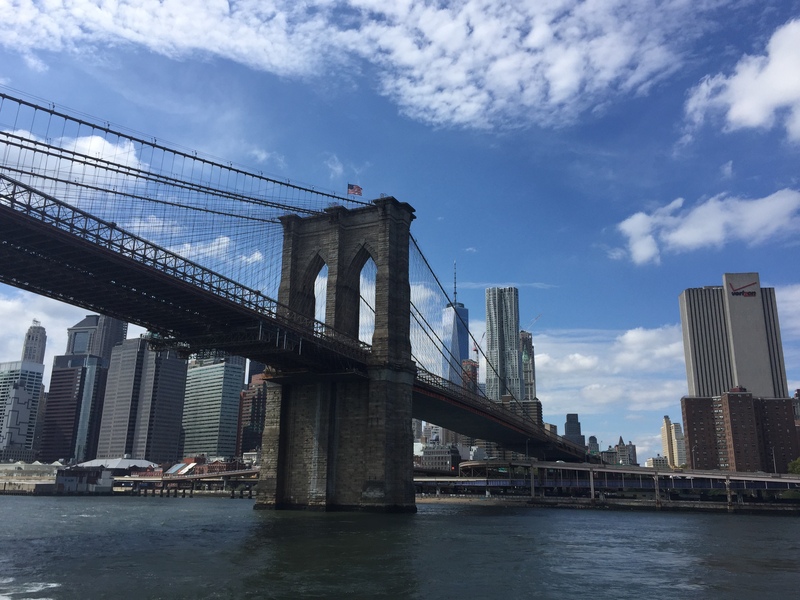 You can take a subway across the water by Brooklyn Bridge Park and catch the most beautiful view of the Manhattan skyline. New York has something for everyone. So, remember to customize your trip to suit what you want to do. If you want to take killer pictures, try a helicopter or boat tour. If you want to eat amazing food, try the many cuisines offered by the food-on-foot tour. 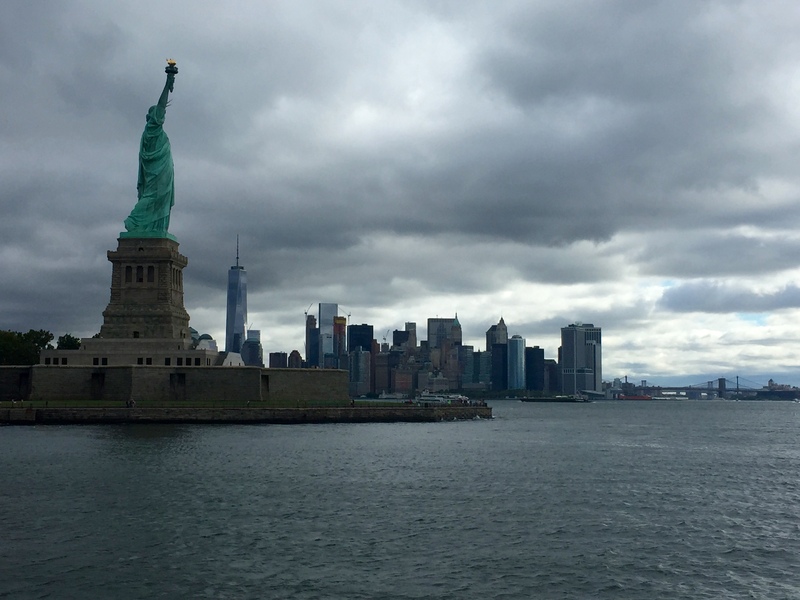 If your focus is on learning the history of New York, you can visit Ellis Island as well as the hundreds of museums that reveal how our country became so diverse. New York is a very special city. For “starters” there are cities I’d recommend more than NY, but nevertheless Big Apple has incredible much offer. I’ve been there twice and I can still think of hundred more things to do!